At the beginning of this week, we passed along to you the results of a test that showed the HTC One M9 running a surface temperature of 132 degrees fahrenheit while getting benchmarked. The HTC One (M8) reached a temperature of 102 degrees in comparison, and the coolest model tested was the Samsung Galaxy Note 4 which hit 100 degrees on the thermometer. One major variable among the devices tested was the chipset, and the Snapdragon 810 inside the HTC One M9 has a history of running hot. But during this week's Uh-oh webcast, HTC Americas president Jason Mackenzie said that he company wouldn't send out any product to consumers unless they were confident in that device. 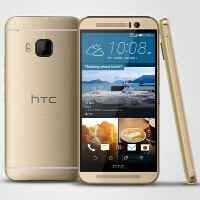 The executive added that the new flagship will be launched starting April 10th somewhere in the Americas region. So how did HTC take care of the temperature issue? According to one XDA member, his source with an HTC One M9 test unit received an OTA update with the changelog listing "thermal improvements and camera improvements." The test unit is now running at about 104 degrees fahrenheit, just two degrees warmer than the HTC One (M8)'s temperature during the aforementioned benchmark test. Earlier today, we told you that HTC has also fixed whatever software issue caused it to delay the launch of the One M9 in Taiwan. Originally scheduled for March 16th, the handset will now be released tomorrow. Your post is hilarious. It almost assumes that HTC (or any other OEM for that matter), has never put out a phone "with problems" before. Check out the issues that the HTC Thunderbolt had with the first-gen LTE chips. Battery life was horrendous because of all the heat it caused. These things happen. It's not out of the realm of possibility. Or the infinite amount of problems with the Nexus 6 or the Gapgate issue with the Note 4. Nice one to shu mxyzptik up. :). No throwing dirt when he lives in a glass space. An overblown issue that was discredited by credible sources. Next. Much less overblown than the Gapgate you mentioned. There's even a website dedicated to pictures of them. But you knew that. Exactly. Or the issue with the bendable iPhones or the failing memory on the 128GB version. These things happen to every OEM. If they happen to every OEM then why did you target the iPhone? I could ask you the same question. Why'd you target the Note 4 & the Nexus 6? No need to get so defensive. I just picked an example. I'm not getting anymore defensive than you are. I picked examples. You picked the same tired old thing regarding Apple. Or the bendgate and antennagate issues with the iPhone (which you can actually find examples of in the real world, as opposed to the supposed gapgate with the Note 4). A device heating up that much is never welcome. It could fry the circuitry if it continues to do that. That's an issue that needs to get worked out because there's no telling what the long term effects are. Remember Lollipop still has that huge memory leak problem. Let's hope they get this fixed pronto. No, lollipop doesn't. It has a new memory leak issue, but the original one regarding the boot animation was fixed. All the newest HTC One M9 scores i see in Geekbench are at SD801 levels in single core ,they must have throttled it hard to keep it cool with the newest software update ( and then the S6 would be some 50% faster in this benchmark). The only time SD810 did ok in benchmarks was in the dev tabs Anandtech and THG did their previews on so chances are those tabs had some cooling to allow it to run at advertised speeds.In phones so far there is no evidence that SD810 can do ok. Maybe they'll have new silicon soon, remains tobe seen. Oh damn, that's some serious drop. Single-core performance went from 1200-1300 to 700-900. Multicore performance went from 3800-4000 to 3000-3400. I wouldn't believe a site called semiaccurate. samsung haterism is so obvious on that site. But how can they fix a problem that wasn't there in the first place?? Didn't HTC deny the news that there are overheating issues with the m9? They said the software wasn't final. There were no overheating issues. Testing sample was a pre-production device with disabled throttling. All other smartphones in this test were production samples with final software (=enabled throttling). Agree, just hope they won't throttle the SD810, it would be a shame... such a powerful chip. Celcius > fahrenheit Metric system is love. The good thing is sens is not heavy so with throttling it won't make much of a difference.